B was thumbing through Ted Haigh‘s Vintage Spirits and Forgotten Cocktails, when she ran across what she thought might be a tasty tipple in The Derby. A quick perusal of the ingredients reveals that it’s awfully similar to one of our all time favorite cocktails, the Oriental Cocktail. 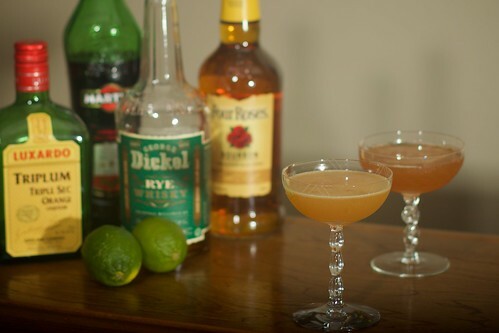 Basically put half as much bourbon as you would rye in an Oriental and up the lime juice and you with the Derby. This version is, according to the good Dr. Cocktail, isone of three versions in the 1947 edition of Trader Vic’s bartending guide and his favorite. 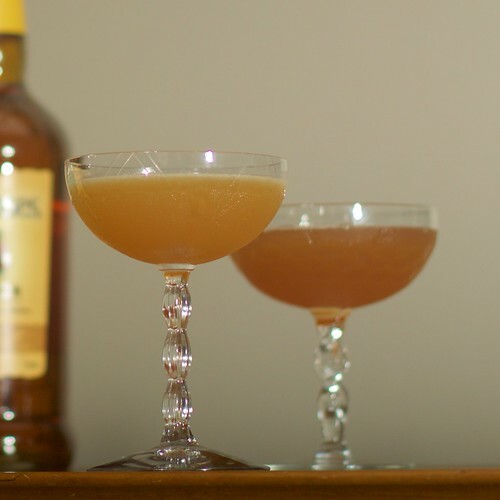 The International Bartenders Association’s version is basically gin and peach bitters and the third entry (according to the Rock & Rye blog) involves, among other things, brandy and pineapple syrup. Shake with ice and strain into a cocktail glass. Garnish, if inclined, with a lime slice or mint leaf. We decided to have them head to head. As you can see, the Derby (front) is a bit lighter. Because it uses bourbon (and half as much) instead of rye, it’s also quite a bit sweeter. We both thought it was fine cocktail, but lacks that certain complex cocktail panache that the Oriental Cocktail had. Still, if you find yourself Julip’ed out on the first Saturday in May, the Derby makes a solid alternative.